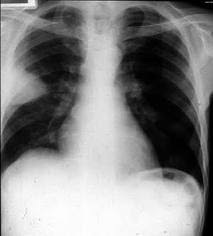 This is an Xray of A 37 year Old female patient who is presented to emergency department with shortness of breath and bluish skin. She was using oral contraceptive and was chronic smoker. On chest auscultation irregular heart beats are found. What will be the probable diagnosis? Answer will be posted after Five answers. All these factors favour emobolus formation by various mechanism. The Xray of female patient shows typical wedge shaped pulmonary infarction of the right middle lobe. Its Pulmonary Infarction. pleural based opacities called hampton,s hump indication of lung infarction,another opacity at hilum of Lung rt.side most likely due to dilated pulmonary artery which occurs in 15% cases of PULMONARY EMBOLISM.